Yesterday, we heard again that Yahoo is laying off 1000 workers. 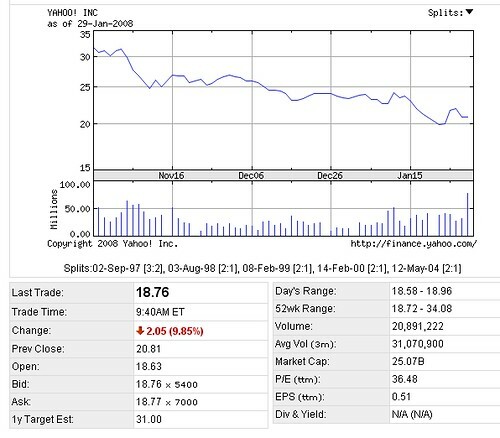 Sadly, Yahoo's stock is also faltering. Why is Yahoo having such a hard time? According to Roger Montti, it's because they are unable to attract teens and young adults. They also are taking in more money but are turning less profit. Is Yahoo going to go down for good? No, forum members don't think so. I think Yahoo has lots going for it with regards to content. It has the best email -- way better than Gmail or MSN Hotmail. The New version of the Yahoo mail (I pay for mine yearly and get the premium). I was watching MSNBC the other night and they were talking about Y Answers and you keep hearing about their OMG site. I think its a great time to invest in Yahoo while their stock is down. Y! is not going anywhere. The problem with Yahoo isn't that they soley need something new or some updates, its that they need to do something to actively shore up their % of users, right now google is pickpocketing them. Then they need to start actively competing with google, taking their users. Additional coverage is at Techmeme and the Yahoo earnings report is on Search Engine Land.